Throughout the year, we will have many opportunities to learn from Farmer Curtis in our school's very own greenhouse. Today we discussed expectations, learned the names of common tools we'll use (and how to use them), and worked inside and outside of the greenhouse doing various jobs such as weeding, watering, and moving cinder blocks. 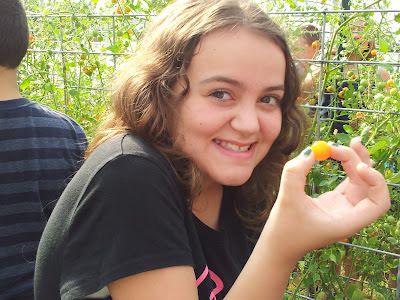 When we were done, we even had a chance to taste some delicious golden cherry tomatoes, which Farmer Curtis referred to as the "vegetable candy" because of how sweet they taste. we can expect from him throughout the year. *Natalie demonstrates how to use a hoe. She said, "You use it to make trenches." *Hailey gets ready to show the class how to use a shovel. "It was really hard!" she said. the class how to use it appropriately. *Makaiah show the class how to use a garden rake. "It was really easy to use," she commented afterward. so it was really hard to push the spade fork in the ground," she said. we got a lot accomplished today--it was hard work! and they were really down in the ground," said Natalie. *In the middle of weeding, Jacob discovered a wolf spider! spider carrying her young," Jacob remarked. and Lexi cultivate the outside beds. "The cultivator was really hard to use," Lexi admitted. 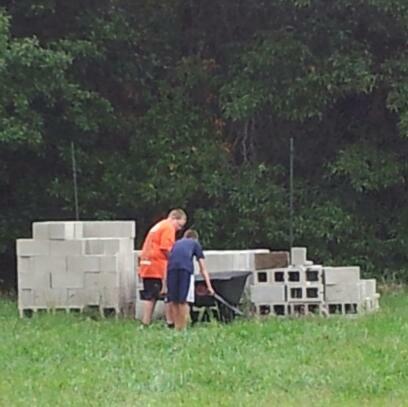 Kenson and Chase work together to move cinder blocks. 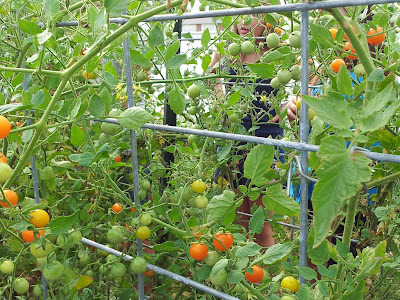 sweet golden cherry tomatoes, which he described as "vegetable candy." Anna shows us a golden cherry tomato she picked. *We used these pictures to practice writing captions together as a class. The last three pictures were added after class, so I (Mrs.Allen) wrote those captions. Hi room 121, I am Felicity from NZ. I am apart of your pen pal class. I really liked this post, it sounds like you all had some great fun. day i hope it was? Hi room 121, it is Hannah from NZ and my class is your pen pals. It is great to see the photos of you all, it looks like you all had a AWESOME time.